With fall upon us, CMHA Sault Ste. Marie is offering another season of Mood Walks, a successful well-being program that operates on a simple premise: get outdoors for your mental health. Mood Walks was developed by CMHA as a province-wide initiative that promotes physical activity in nature, or “green exercise,” as a way to improve both physical and mental health. An increasing body of evidence suggests that one of the best ways to improve mental well-being is by simply spending more time outdoors. Walking in nature has been proven to provide health benefits such increased energy and immunity, increased weight loss and fitness, increased Vitamin D production, and reduced risk of diabetes, heart attacks, and cancer. 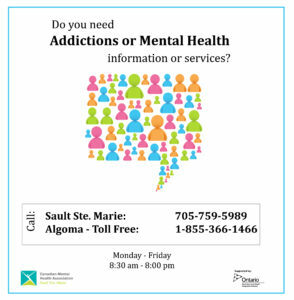 CMHA Sault Ste. Marie Mood Walks program features Walks all around our beautiful city at different locations. Please click here for the schedule and locations.